. We have been passing through the galactic equator since 1998. It takes 18 years, I believe to do so. It completes around 2016 which is a mystical date for some American freemasons. Personally I think our sun moving through the constellation of Ophiuchus is important for 2012. Because of the precession, the sun has only recently started to pass through the constellation of Ophiuchus which is situated between Scorpio and Sagittarius. Nostradamus referred to this constellation as having great importance for humanity. In mythology Ophiuchus was able to heal the world and make its people immortal but Zeus struck him down with a thunderbolt in jealousy. Then Zeus placed him in the heavens and came him a large snake to hold on to and control. Because Ophiuchus is situated at the dark rift or galactic equator, the snake is seen to represent the milky way. The symbol for Ophiuchus is similar to the medical associations snake twined round a staff. [because Ophiuchus was a healer] It is also suggested that it is a symbol of DNA which I personally find interesting because, I believe that DNA is not of this world but was transplanted to this world. I personally believe that when the axial precession allows our sun and earth to conjunct the dark rift in Ophiuchus on the winter solstice [Dec 21], then the DNA of life on this planet upgrades. Another pet theory of mine is that the DNA shift on this alignment will allow our pineal gland as part of our ‘third eye’ to be able to produce melatonin whilst awake. Therefore we will be able to live / inhabit a dream state [like the aborigines and Hopi peoples believe]. In this dream state I feel that we might be able to pass into the 4th dimension to begin the 5th human civilization. This would effectively make us seem to disappear to the people whose third eyes do not awaken. They would seem to be left behind in the 3rd dimension and they would perish with the dying 4th world civilization. I think the change will be very fast if not instant because of the line in 2nd Corinthians in which Paul says that “we will all be changed in the twinkling of the eye”. The Hopi peoples also have predicted instantaneous changes causing immense psychological stress to some. The ancient Olmecs people who allegedly passed on their knowledge to the Mayans were said to have ‘vanished’ together on mass. Shaman say that their third eye opened and they elected to pass to the 4th dimension and permanently out of our world. This sounds strikingly like the ‘Rapture’ that Jesus Christ promised his true believers in the ‘final days’. The bible says that the chosen will be seen to just vanish on mass and be spared the tribulations of the apocalypse. I think the rapture refers to what might happen to many people when we open up our third eye and enter a dream state & are able to pass freely into the 4th dimension. Because the nature of the fourth dimension involves Time, I believe that those that pass will seem to be immortal. 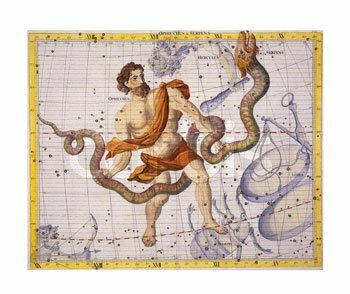 [not bound by linear time] Hence the legend that Ophiuchus was able to make mankind immortal. Lastly I feel that the Resurrection also promised by Jesus in the final days will be enabled by the great change. By this I surmise that all previous lives ‘soul’ consciousness will become free of the limbo that they dwell in and will be reunited with the immortal spirit entity that makes up the core of our personal psyche. Can I have clarification on your statement at the beginning of this blog where you state, “Because of the precision, the sun has only recently started to pass through the constellation of Ophiuchus which is situated between Scorpio and Sagittarius.” I know you mean precession, which is the wobble of the Earth on its axis ~(which takes approximately 26,000 years to complete a circle) and can be described as at any one point to be pointing towards somewhere in the 360 degree zodiac. This wobble puts the astrological alignment of the zodiac out of sync with the celestial zodiac. I believe that that the current out of syncness is one astrological sign. Astrologically we are passing from Pisces to Aquarius — so how is the current precession of the equinox’s pointing towards the area of Ophiuchus, between Scorpio and Sagittarius? You correctly point out that the axial precession of the spring equinox is currently occurring in Pisces and will further precess on into Aquarius some time in the near future. This ‘wobble’ in the axis of our planet means that the position of our Sun on both the equinoxes and the solstices differs from year to year. Because of this axial precession, the winter solstice on Dec 21st is occurring on the cusp boundary between Ophiuchus and Sagitarius. More importantly, on the winter solstice of 2012, the Solar ecliptic axis is aligned with where the galactic centre point is obscured by the bulge in the dark rift in Ophiuchus and Sagitarius. The dark rift, the galactic centre, and the galactic ecliptic are three separate distinct entities. However the Dark Rift is an area that appears dark which runs adjacent to the centre axis of milky way starting at the constellation of Cygnus, the Great Rift stretches to Ophiuchus, where it broadens out; to Sagittarius, where it obscures the Galactic Center; and finally to Centaurus. I have altered the text in the post to reflect this because it did seem confusing and unclear. This is a very good question and something that i have also questioned. Why does the Earth’s and the solar ecliptic have to be aligned with the milky way galactic ecliptic. I point out that our solar systems magnetosphere shield or heliosphere is exponentially getting weaker. This also coincides with the Earths own magnetosphere getting weaker. The resultant effect is an increasing penetration of cosmic rays into our inner solar system. A very likely cause of the our Heliosphere, our Sun’s magnetic shield growing weaker is the battering from the growing counter forces of the milky way’s own magnetic & gravitational fields. If you examine the form of the Milky Way, one can see that it is a flattened spiral galaxy. Edge on, it is very narrow compared to the expanse of its diameter. It is akin to looking at the edge of a CD. There is a super massive black hole which forms the hub on which our spiral galaxy rotates. The galactic ecliptic is at 90 degrees to the axis of the spin. Mathematically, we are crossing through the X axis. Along this axis or ecliptic, the magnetic and gravitational forces are immensely strong. These are the forces which coral all the galactic solar systems into this narrow band that borders the ecliptic. This may explain why out own sun’s magnetic forces are in decline, and the subsequent exponential increase in the amount of cosmic rays that are breaking through this shield. WOW. I am a true follower of Christ and I believe the Lord has brought me here to see this…..he has shown me Ophiuchus and the pineal gland and how it is “the seat of the soul”…I think we are really headed into something that so many will not even look at and it is so sad.. I pray that I will be one of those who will reach the next age…I agree that it will be like shifting into a different dimmension although I am not expert on anything, only the Father showing me this. I think it is correct that sudden destruction comes, but at the very same time that we will be shifting into another dimension. The eye or the pineal gland is awakening in the true followers of Christ, at least in my circles,,not sure how it is in the big picture of things, but I do know that the Lord has brought me to see this. I am thankful to have found this. This peace you wrote is lovely and I came across it for the first time today, Dec 21, 2016. All is aligned all the time. Much love and peace to you. No, you are wrong. The Snake is a literal creature that made its exodus to that region of space when the planet which you call Earth (and wonder what it is that THEY call it), suffered a CME and successive Meteor impacts, which wiped out much of the surface life and caused the Ones who survived to leave the Earth and travel the stars conquering what other worlds that they could to aquire what they needed to live. They left you the Dragons. The Naga instructs many who are wise among whatever kind they contact. It is your Quetzal Quatyl, your serpent in the garden of Eden. It is te species which teaches all worlds controlled by the Queen Mother of the Drakon. She holds a stone of Brown Crystal from which she can see into the eyes of any creature that serves her. Ophiuchus is the rift between the Andromedans and the D’Jinn. The D’Jinn taught the Andromedans in secret and hid their world until it was destroyed by the Andromedans in ignorance. If one cannot adapt to change you will not survive among these beings. 2010 I remembered what I am. And the words of men and women have awakened from me the teachings of these histories. The Jurassic period was the Garden of Eden and the ELE of that period is the Cherubim with thee sword of fire. There is no going back to it. The Queen sent the Nagas to teach men and women the arts of civilization by word of mouth. They will return as the Pliedians return and the Drakon will hold the Tengri Tengri at bay and the major change will be around Saturn. The Andromedans will make everyone Klee, and the Peace will be made. You want an Apocalypse I will ask them to give you one. I got clout in the Heavens kid. Who is one, who can look within themselves and say, “I never knew anything until I learned (remembered) myself.” Whom has heard, “A man who knows Himself is worth more than the World.” And; had it be the God’s honest truth. Your God is a real Entity among all his fractals of children. The human race has been spared an Apocalypse before. There are plenty here among you and they can do all that you imagine your “Shadow Government” can do(And; more), in more ways than you can imagine. Nostradamus had something to say about Ophiuchus in his “Centuries” unfortunately you have to pay to know, and I have little in Terrestrial Currency. What I have told you is the truth. Aderrak, among you; among them all. This is you close encounter of the fifth kind. Jesus told His Apostles that John the Baptists head was cut off, Prophecy had been cut off from the Body of Christ.” But God told me something, too. It told me that it can make anyone exist that It desires, as many times as it wishes, And It will make me again as it does when any soul is tested. Also the truth. Zues and His Titans are Mankind liberated in the Cosmos. Consider this your, Jintelligence Report. And; the Caduceus representing a healer makes sense, because It is the staff of Moses and the Chief Priests of Pharaoh, as well as its use by other shamanic cultures during the primitive period, of much of what you would call Historic Mankind. That is Mankind at the dawn of this current Historical Period for Humanity. Also the Drakons have one of the largest historical Genetic Records Archive in the known Universe. The Drakon are wicked good healers. Their medical technology is some of the best in this Galaxy. Rivalled only by Those Who Klee.